Mrs. H., aged 42, seen through the kindness of Dr. O. B. Douglas. Last winter (1878), her husband came up behind her as she sat reading and kissed her suddenly upon the right ear, taking her completely by surprise. She suffered a great shock and had a roaring in the ear for some time. The incident made her very “nervous” for two or three weeks afterwards. During the past summer she was told by her relatives that she was becoming deaf on the right side. She paid no attention to it until six weeks ago, when she tried her right ear with her watch and found she could not hear it. She gives satisfactory evidence of having heard a whisper well with the right ear during last winter and spring. Has had occasional tinnitus during the past few months after taking cold. Enjoyed music very much formerly, but does not now. The piano-practice of the children at home annoys her. Whistling is particularly disagreeable. All noises disturb her somewhat, so that she has “felt afraid that she was becoming nervous.” General health is good. Menstruates regularly. No cardiac trouble detected. Father died of paralysis. ‘Paralysis’ at this date could mean many things, but often denoted stroke. The doctor examined her, but found little to explain her symptoms. The drumheads [eardrums] are about alike and show nothing to account for deafness. Air enters the right drum by both catheter and Politzer’s method, but does not alter hearing. Politzer’s method, also known as Politzerisation, entails blowing air up the nose while the patient swallows – a recent innovation at this date, since it first entered clinical practice in around 1863. If the Eustachian tube, the channel between the middle ear and the throat, has become blocked, it becomes impossible to equalise the pressure between the middle ear and the outside atmosphere. This creates a pressure gradient across the two sides of the eardrum, which impairs hearing (as happens to passengers on an aeroplane as it climbs and the cabin pressure falls). Politzerisation forces air through the Eustachian tube to equalise the pressures artificially – the fact that the manoeuvre had no effect indicates that a blocked Eustachian tube was not the problem. All notes of the piano are heard, but she says they do not sound “clear,” even with both ears open. Dr. Douglas examined the naso-pharyngeal space and the mouths of the Eustachian tubes and found nothing abnormal. This seemed to be a case of deafness from affection of the labyrinth, with no apparent cause except the kiss upon the ear. More precisely the cochlea, the organ of hearing. The labyrinth, a more general term, also includes the mechanism which gives us our sense of balance. The concussion from the kiss, may have caused the loss of hearing at once: or, as seems more likely, it may have produced changes in the labyrinth, which, in combination with the general nervous shock, served as a foundation for a gradual loss of hearing subsequently—as, for instance, by some atrophic process. This seems unlikely to me. 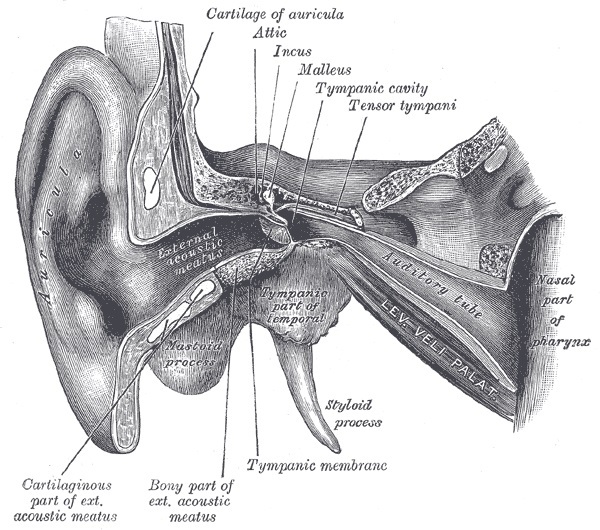 I suppose it’s conceivable that an enthusiastic kiss right on the opening of the ear might cause enough suction to do some damage within, but in that case one would expect the eardrum (the tympanic membrane) to be damaged, not the inner ear. Given her prolonged anxiety after the incident it’s possible that the condition was psychological; but I’d hazard a guess that whatever process was responsible for her hearing loss had already begun on the day that her husband crept up to kiss her. The human brain is always looking for patterns, and so trying to identify a precipitating event of this kind is only natural – but sometimes it simply isn’t possible to correlate cause and effect where disease is concerned. If there are any otologists, audiologists or ENT specialists reading this I’d be interested to know what you think! Another fascinating tale of medical yesteryear. I rather agree with you that deafness was some other disease process and not triggered by The Kiss, however Romantic and operatic this idea is. I am a little suspicious that her fathers death from “paralysis” might be relevant. Was this in fact General Paresis of the Insane, otherwise known as the terminal stages of tertiary syphilis? Was the poor ladies nerve deafness in fact related to her having a positive Wasserman reaction herself? We may never know. Thank you for this interesting addition! I suspect her “deafness” originated with the children’s piano lessons.